Click here to view Eva's Prayer Service. Click here to view Eva's Funeral Service. Eva Joyce Lyren, 93, of Aberdeen, and formerly of Turton, SD, passed away Friday, January 18, 2019, at Bethesda Home of Aberdeen. Funeral services will be 2:30 pm, Saturday, January 26, 2019, at Schriver’s Memorial Mortuary and Crematory, 414 5th Avenue NW, Aberdeen. Schriver’s Memorial Mortuary and Crematory, Aberdeen, is in charge of arrangements. Family and friends may sign Eva's online guestbook and also view her service via the live stream service link at www.schriversmemorial.com. Visitation is 5:00-7:00 p.m., Friday, at the mortuary, with a prayer service at 7:00 p.m. Visitation continues one hour before the service at the mortuary on Saturday. Eva Joyce (Barrie) Lyren was born on September 8, 1925, to Louis Exerie and Agnes (Fortin) Barrie at the farm east of Turton, SD. Eva grew up on the farm where her father started farming in 1906. She went to the Barrie Country School, where her father also went to school, a mile from her home - the transportation was horse and buggy and a cutter in the wintertime, or walking. In the ‘Dirty 30’s”, Eva remembered once the teacher lighting a match to see if all the pupils were there. During Eva’s first year of high school in Turton, she cooked and helped at the home where some of the teachers boarded. She graduated in 1943 with her class of six from Turton High School. After spending some time in California working at an ice cream store owned by her aunt and uncle, Eva returned home and married Lloyd Gunnar Lyren on October 14, 1944. They lived on three farms around the Conde and Turton area. During this time, they experienced tornadoes, hard winter storms, and big spring floods often causing them to walk to the highway or to the neighbor’s farm pulling Ron on a sled. But it was also when electricity first was installed in the country - a glorious time! In 1954, the family moved to the farm Eva grew up on and farmed until 1982 when they moved to Turton, SD. They raised their family of four working hard on the farm, attending the Methodist Church in Conde, and taking time for visits with neighbors and family. With Ron and Gayle, they took a fall trip each year to the Black Hills for a week, which was special family time. With Dwight and Penny, they took their camper to the lakes during the summer. The whole family was very involved with 4-H, and Eva was a leader for over 30 years. Eva and Lloyd enjoyed the Big Band Era days going to many dances and in later years changed to square dancing, traveling all around with their friends. Many happy trips were made throughout the state with six people packed in a car. The ladies wore their square dance dresses and cancans. Eva was also very active with extension clubs in Clark and Spink counties for over 50 years. The VFW Auxiliary in Turton was important to Eva where she served as president for nine years. Eva enjoyed taking Senior Citizen bus trips to several interesting places. She also took trips to South Carolina; Disneyland, CA; and Florida where she put her feet in the Gulf of Mexico - her whole life she was afraid of being in the water. Over the years, Eva spent many, many hours making over 40 quilts, hand-quilting most of them. She was very proud of them and gave them to her family. Eva loved the summers and most years tended a large garden, canning and freezing the produce. She also raised chickens and each year set aside a day for fixing them for the freezer - it was a long day!!! Her flower beds were also a joy to her, like her father, she loved hollyhocks and Christmas cactuses. One Christmas cactus is over 100 years old, and it is beautiful. 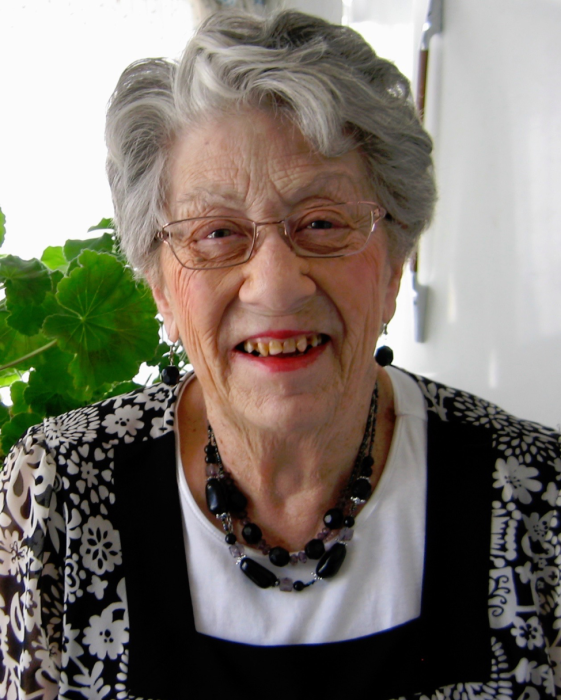 Eva lived at Gellhaus Carehaus, Angelhaus and Bethesda Home in Aberdeen for six years. Eva was preceded in death by her husband, Lloyd Lyren; parents, Exerie and Agnes Barrie; sister, Hazel Imsland; infant sister Louise Barrie; and brother, Antone Barrie. Eva is survived by her four children: Ronald (Joanne) Lyren, Gayle (Jim) Van Camp, Dwight (Katy) Lyren, and Penny (Kurt) Stueven; 11 grandchildren; and 12 great-grandchildren.